As most of you are probably aware by now, this blog is full of spoilers, but I thought I’d make another spoiler warning for the remainder of this post, as I’ll be going into more detail than usual. So, what we’ve talked about recently is the main design on the dungeon, how things will start out once you enter the ship, and some of the mechanics we’re looking into using here. To begin with, we’ll be adding another character that will make its first appearance earlier in the story than we are currently. While we’re not super excited to go back in time and add characters, hints and other things in areas most of you have likely played through already, I’m afraid it’s unavoidable when working on a game like this, chapter by chapter. We’d have to be geniuses or have thought out the game in much more specific detail before beginning any area to avoid this completely – and often you don’t realize what’s missing until you’ve had enough feedback from beta testers (or when it comes to story elements I guess you guys are more like beta readers). We already know we’ll add a bunch of extra scenes in the beginning to flesh out the story and relationships slightly, before the game is done. This will just be one more thing like that. Hopefully, this will give you all an incentive to play through the game once more at release, when all these additions and small changes are in place, to experience the story as we intend it to be experienced – in one go with all the proper story elements there from the beginning! So, as you enter said ghost ship, you’ll meet with a flying weapon and someone hurling curses at you that you can’t see. Well, that’s a bit of a problem! Ignoring this threat, you continue onwards, battle some of our new enemies (more on those later), see a locked door, and eventually run into the scientist who will give you his spirit world machine that allows you to enter and interact with the spirits haunting the ship. The gimmick of the ship will be to enter and exit the spirit world in order to solve puzzles and defeat enemies. Some enemies you’ll only be able to damage in the spirit world, but entering the spirit world will allow them to attack you with more attacks and deal more damage, as well. There will be enemies harassing you in the regular world, too, of course – so nowhere’s truly safe, but each world will have their own challenges. We’ll have our work cut out for us in making sure there is balance between the two and none you just stick to the entire dungeon. One of our ideas for this is having a meter limiting how long you can spend in the spirit world, since that’s the place you’ll be able to get rid of most of the enemies – and it’s a mechanic that helps increase the stakes in certain puzzles, when you can’t spend unlimited time solving them. 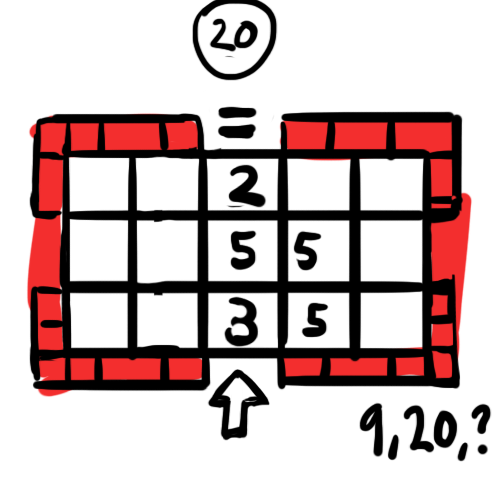 As you might have guessed, there will be a puzzle of some sort in the middle. While we know approximately what this will look like, we haven’t ironed out the specifics yet so for now it will remain empty. Earlier we actually thought we’d have some sort of desert storm challenge there, where you’d have to navigate your way through a desert storm, barely able to see anything. 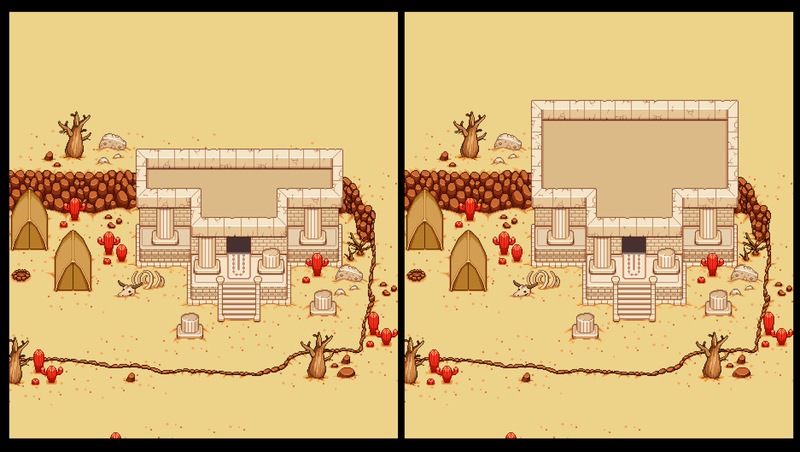 Since we didn’t have the details or layout for that ironed out yet, I just left that part of the desert empty. 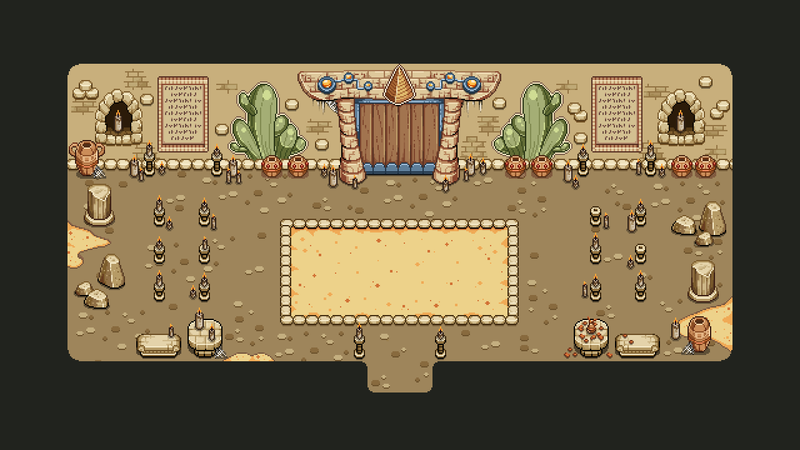 Since then, we changed things around and put the map with the saloon to the left instead, so now it was simply time to complete the map. 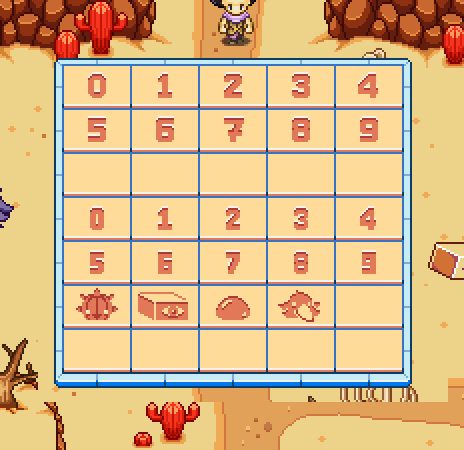 We plan on having three puzzles like this inside the cave, of varying difficulty (one will likely have 9 plates, another 20). One will also feature plates with enemies on them, which means you’ll essentially build your own encounter once you step out of the plates. Fun times! In the end, it’s likely we’ll adjust the colors of this – but for now this is the basic idea of what they’ll look like! Posted by Secrets of Grindea at 2018/07/09. Tags: animation, Enemies, environment, gif, Weekly Recap.